In the grounds of the owner's smallholding in the hamlet of Clapton Wick. Set between the historic towns of Clevedon and Portishead making it ideal for both business or pleasure, couples or families. 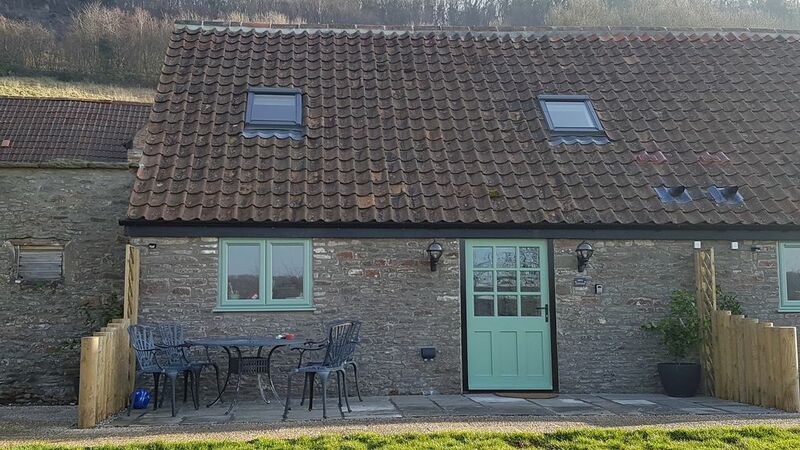 This fully insulated recent barn conversion provides a modern living space with impressive vaulted ceiling, open plan lounge/diner/kitchen, spacious bathroom and 2 bedrooms. It boasts all the conveniences of gas central heating, a fully equipped kitchen with built in fridge with ice box, dishwasher, induction hob, electric oven and microwave. The lounge has a comfy corner sofa and wall mounted TV with dining table for 4 people. Outside there is a patio seating area and level access to private car parking. If you need an additional bed, the neighbouring 1 bed Swallow Cottage may also be available. Deer cottage is a cozy, warm, well equipped cottage which is in a superb location. It was immaculately clean and had everything that we needed for our stay as a family of four adults. Comfortable beds, excellent shower, tasteful decor and thoughtful touches, such as food essentials, were very much appreciated. The hosts, John and Liz, could not have been more helpful both prior to and during our stay. We would highly recommend this property and certainly hope to return. Thank you both. All of us and the dogs really enjoyed our stay. Lovely cottage and facilities. Liz and John great hosts. Hope to return soon. Thanks again. Liz and John are a lovely friendly couple with a delightful cottage. The location was excellent being within 1/2 an hour of Bristol, minutes of the coast and wonderful dog walks right on the doorstep. The cottage was immaculately presented with everything we needed for a very comfortable stay. Access was extremely good, all being on the flat and ideal dog friendly area directly to the front of the cottage. Even the friendly sheep were very welcoming. We would highly recommend this cottage for anyone wanting a base to explore this wonderful region or just somewhere very comfortable to chill out. We would not hesitate in returning. Clean, cozy, friendly helpful host. We love it. Sparkling clean, lovely thoughtful touches, everything you need for cooking, friendly helpful host, beautiful area with lots of outdoor space. We have really enjoyed our stay. Had a lovely relaxed weekend at Deer Cottage. Even our dogs, Lucy & Pippa, have asked to go back. Liz and John are great hosts. Would recommend a stay here. Comfortable and cosy, heating system is great, which is essential as we traveled in January and it was freezing outside. Beds are comfortable, bathroom with shower is modern and clean, the area is quite and serene, so great sleep is guaranteed. The hosts are lovely, they even provided some essentials for breakfast in case we forgot as we were arriving late. If you ask Liz for Latitude and Longitude and use them for your satnav, you will arrive to exact spot. Very recommended.